Size 17.5 x 28 inches. 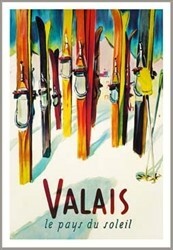 When skis were wood and thongs were leather straps on your bindings… This reproduction poster is from the 1940’s. 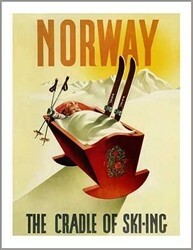 By the 1930’s Northland claimed to be the largest ski maker in the world and Northland Ski Company made skis, hockey sticks, toboggans and sleds from 1911 to 1974, in St. Paul MN and Laconia, NH. 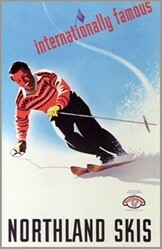 The skier on the poster is Luggi Foeger, who taught skiing for Hannes Schneider at St. Anton in Austria. 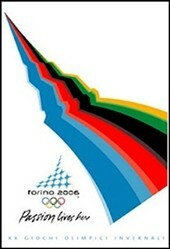 Foeger came to the U.S., as part of a wave of European ski instructors, in the 1930’s. He later joined the 10th Mountain Division. He was a ski racer, ski area developer, and movie producer. Nice quality reproduction!